I go to Kapitolyo, Pasig a lot. Our eldest studied there for a year at Aheadstart. We were looking for office space for a while there too (a topic for another time). The restaurants are good, and there are always new ones popping up. With the opening of Capitol Commons, even more places are opening up in Kapitolyo. I have seen Rub for a long time now, and we always passed it over for other places like Mad Marks (whose ice cream and steak are so yum!). Today, we tried it. 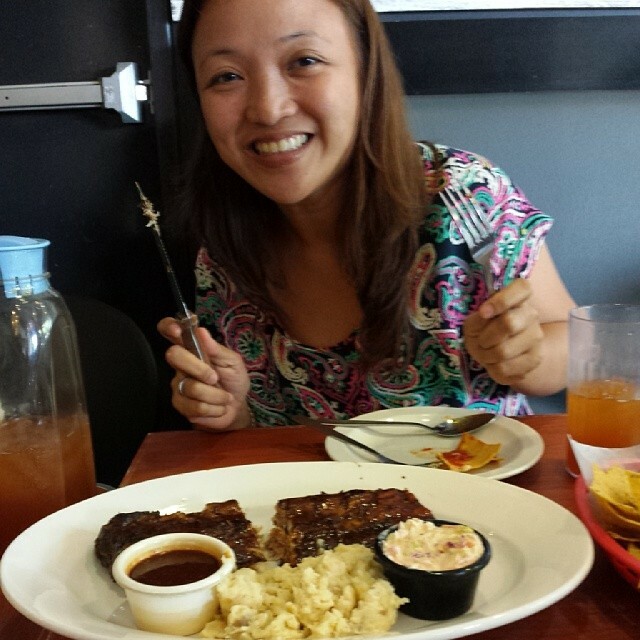 We had a meeting with the Javiers, our best buddies, and we wanted to meet over ribs. Because who doesn’t want to meet over ribs? Des and I ordered the double ribs with sides of mashed potatoes and coleslaw. A pitcher of iced tea. Appetizer of nachos. They were all good. Not a long wait. The dips for the nachos were yum, and the sauce of the ribs was yum (ha ha I can’t be a food blogger… but then again, it is either yum or yuck, right?). The size was just right for the both of us, but on a hungry day I can probably eat the whole thing myself. The place is nice and cozy, so if you plan to go, go early. We got in at 12 noon and got the last tables available. There were people waiting outside in the heat for more tables. It was a good meeting with good friends and good food. Not a bad way to spend a Friday lunch!